UK election: What happens next? 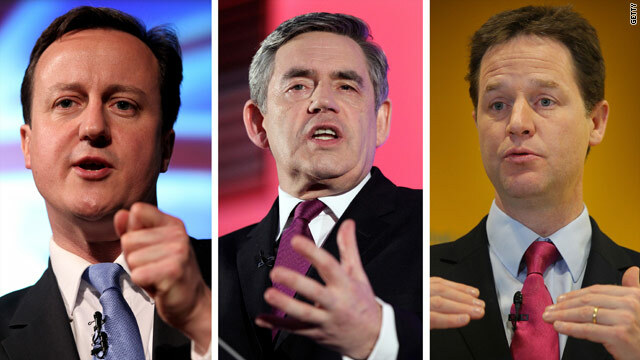 David Cameron, Gordon Brown and Nick Clegg are all tussling for power following the uncertain outcome of the UK election. London, England (CNN) -- The closest-fought UK election in decades has resulted in a hung parliament in which neither of the two biggest parties has a clear majority that would allow it to pass legislation. With 649 out of 650 election results announced, David Cameron's center-right Conservatives have 306 seats, falling short of a certain majority in the House of Commons. Prime Minister Gordon Brown's Labour party took at least 258, the Liberal Democrats came third, with at least 57. So who will form the next government? No one really knows yet which party will form the next government and there is great uncertainty about the immediate future, causing sterling to fall against other currencies during the past few days. There is no written constitution in Britain, but convention has it that a sitting prime minister has the right to try to form a coalition government before the opposition leader. Whatever happens, a PM remains in power until his or her party is defeated in the Commons or admits defeat and travels to Buckingham Palace to resign to Queen Elizabeth, who is the head of state. In that case, the monarch would invite the leader of the biggest party, which is now the Conservatives, to try to form a government. The Liberal Democrats, the third biggest party, may have won less seats than expected -- but their support would enable either Labour or the Conservatives to command a majority in the Commons. Liberal Democrat leader Clegg said Friday he would be willing to talk first to the Conservatives as they had taken the most votes -- and the two parties have been in talks since then. "We're in a fluid political situation, " Clegg said Friday. "It's vital that all political parties, all political leaders act in the national interest and not out of narrow party political advantage." Could the Conservatives and the Liberal Democrats do a deal? The Conservatives must forge some kind of deal with a smaller party in order to reach a voting majority in Parliament, and they are most likely to turn to the Liberal Democrats, analysts have said. Parties smaller than the Liberal Democrats hold too few seats in Parliament for them to be realistic choices for the Conservatives. David Cameron Friday emphasized areas where the two parties agree -- including education reform and scrapping plans for national ID cards -- and offered the Liberal Democrat leader a "big, open and comprehensive offer." It's also easier for the Conservatives to seek a partnership with just one party rather than many, said Joe Twyman, director of political polling at YouGov. Such a partnership, however, does not necessarily have to take the form of a coalition, Twyman said. "My personal opinion is that the most likely scenario is the Conservative Party forming a minority government and going into some sort of leg-by-leg association with the Liberal Democrats," Twyman told CNN on Saturday. "The Conservatives hope that will give them the support they need to get across their economic policies, which are the most pressing." Are there any stumbling blocks to a Conservatives-Liberal Democrat deal? The Conservatives and Liberal Democrats have very different policies on Europe, the UK's nuclear deterrent, immigration and, crucially, electoral reform. On Monday Democrat lawmaker and negotiator David Laws said the two parties had not yet agreed on "education funding, fair taxes, and on issues in relation to voting reform." Though they are dubbed the kingmakers, because their support could be crucial to either of the two big parties, the Liberal Democrats also don't have much room to play with, Twyman said, especially if there is another election in the near future. "As the Lib Dems are reported to have significantly less financing than the other two parties, they would have the most to lose from another election being called very soon, because elections are an expensive business," Twyman said. Prime Minister Gordon Brown stepped down Monday, following the electoral defeat, saying: "As leader of my party I must accept that that is a judgment on me." The previous Friday he offered to hold talks with Liberal Democrat leader Nick Clegg on the formation of a new government, if his discussions with Cameron fail to reach an agreement. The Liberal Democrats are broadly centrist and might be expected to join Labour. Clegg said only last week that "historically, Labour and Liberal Democrats are two wings of a progressive tradition in British politics." But Clegg failed to hide his antipathy to Brown, saying he would not allow him to remain "squatting" in Downing Street. The Liberal Democrats began more formal talks with Labour Tuesday -- but these ended just after lunch Tuesday, with no word on the outcome or when the talks might resume. Can Labour stay in power? Mathematically it's just possible. Labour has won 258 seats, so with the 57 seats won by the Liberal Democrats, Brown could try to form a coalition with other smaller parties, such as nationalists in Scotland, Wales and Northern Ireland. Sinn Fein does not take up its four seats in the Commons, nor does the Speaker vote, so in fact Brown might be able to stay in power with a coalition of fewer than 326 MPs. But the numbers don't seem quite there for Labour and the Lib Dems to form a stable government and pass legislation, according to CNN political contributor Robin Oakley. Labour can offer the holy grail of a referendum on electoral reform for the Lib Dems, who had a poor election result despite leader Nick Clegg's impressive performance in the televised leadership debates. The current first-past-the-post electoral system is heavily weighted against the smaller parties so this might help Clegg persuade his party to join Labour in government, Oakley added. However, his party has a locking system to prevent its leader unilaterally joining a coalition that was made when former leader Paddy Ashdown was suspected of doing the same with ex-PM Tony Blair. Tellingly, several Labour lawmakers have said that Labour should accept defeat and go into opposition. How often does Britain have coalition governments? They are very rare in British politics. The last time Britain had a hung parliament was in February 1974, when Edward Heath's Conservatives gained more votes but fewer seats in Parliament than Labour. Unable to form a deal with the Liberal Party, the Conservatives stayed on in a minority government, but found themselves back at the polls by October.